The Apelin receptor (Aplnr) is essential for heart development, controlling the early migration of cardiac progenitors. Here we demonstrate that in zebrafish Aplnr modulates Nodal/TGFβ signaling, a key pathway essential for mesendoderm induction and migration. Loss of Aplnr function leads to a reduction in Nodal target gene expression whereas activation of Aplnr by a non-peptide agonist increases the expression of these same targets. Furthermore, loss of Aplnr results in a delay in the expression of the cardiogenic transcription factors mespaa/ab. Elevating Nodal levels in aplnra/b morphant and double mutant embryos is sufficient to rescue cardiac differentiation defects. We demonstrate that loss of Aplnr attenuates the activity of a point source of Nodal ligands Squint and Cyclops in a non-cell autonomous manner. Our results favour a model in which Aplnr is required to fine-tune Nodal output, acting as a specific rheostat for the Nodal/TGFβ pathway during the earliest stages of cardiogenesis. In one of the first events that happens as an embryo develops, cells become the different stem cell populations that form the body’s organs. So what makes a cell become one stem cell type rather than another? In the case of the heart, the first important event is the activity of a signaling pathway called the Nodal/TGFβ pathway. Nodal signaling can drive cells to become many different stem cell types depending on its level of activity. Many different levels of regulation fine-tune Nodal signaling to produce these activity thresholds. Zebrafish that have a mutation in the gene that encodes a protein called the Apelin receptor have no heart. The loss of this receptor interferes with how heart stem cells (called cardiac progenitors) are made and how they move to where heart development occurs. Deshwar et al. have now studied mutant zebrafish in order to investigate how the Apelin receptor influences early heart development. This revealed that Nodal signaling levels are slightly lower in the mutant zebrafish embryos than in normal fish at the time when Nodal activity induces cardiac progenitors to form. When Nodal activity is experimentally boosted in zebrafish that lack the Apelin receptor, they become able to develop hearts. Deshwar et al. also found that the Apelin receptor does not work in cells that produce or receive Nodal signals. This suggests that the Apelin receptor modulates Nodal signaling levels by acting in cells that lie between the cells that release Nodal signals and the cardiac progenitors. An important question for future work to address is how this modulation works. As Nodal is a key determinant of many cell types in developing embryos, learning how Apelin receptors regulate its activity could help researchers to derive specific cell types from cultured stem cells for use in regenerative medicine. During gastrulation, complex cell movements occur which result in the localization of progenitor populations to discrete embryonic regions for subsequent organogenesis. Loss of Apelin receptor (Aplnr) function in zebrafish, as manifested in the recessive grinch mutant, results in a decrease or absence of cardiogenesis, and affects expression of the earliest known cardiac mesoderm markers (Scott et al., 2007; Zeng et al., 2007). The role of Aplnr in the proper formation of the heart appears to be conserved in vertebrates. In mice, Aplnr (also known as Apj and Agtrl1) is expressed in the gastrulating mesoderm, with Aplnr mutant mice exhibiting incompletely penetrant cardiovascular malformations including thinning of the myocardium, ventricular septation defects, an enlarged right ventricle and improper heart looping (Kang et al., 2013). In vitro, overexpression of Aplnr in mouse embryonic stem cells results in enhanced cardiac differentiation of embryoid bodies, while Aplnr inhibition leads to impaired cardiac differentiation (D'Aniello et al., 2013; D'Aniello et al., 2009). While a role for Aplnr signaling in the earliest events of cardiac development is evident, how Aplnr functions in this context remains unclear. In zebrafish, Aplnr has been implicated in the movement of cardiac progenitors during gastrulation to the anterior lateral plate mesoderm (ALPM), the site of heart development, with a delay in anterior migration of presumed cardiac progenitors during gastrulation (Paskaradevan and Scott, 2012). These early effects on gastrulation movements suggest an early function for Aplnr in cardiac development, well before expression of cardiac mesoderm genes, such as Nkx2.5, is initiated (Scott et al., 2007; Zeng et al., 2007; Paskaradevan and Scott, 2012; Pauli et al., 2014; Chng et al., 2013). Interestingly, the requirement for Aplnr in cardiac development appears to be primarily non-cell autonomous, which is to say that Aplnr is not required in the cells that will form the heart per se but rather in surrounding cells (Paskaradevan and Scott, 2012). 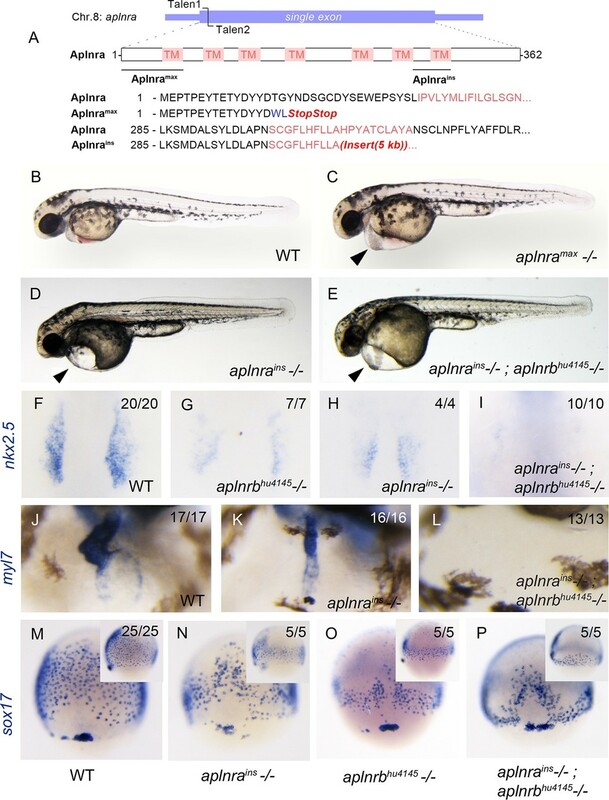 The genetic deletion of aplnrb or its endogenous early ligand elabela (also known as apela or toddler) causes gastrulation movement defects with aberrant cardiac and endoderm development in zebrafish (Paskaradevan and Scott, 2012; Pauli et al., 2014; Chng et al., 2013). This, together with the ability of overexpressed Aplnr to rescue cardiac differentiation in Cripto-null mouse embryonic stem cells (D'Aniello et al., 2009), indicate a strong functional link between Aplnr and Nodal signaling for proper cardiac specification and differentiation. In this study we report that Aplnr directly modulates Nodal/TGFβ signaling during gastrulation, a key pathway essential for mesendoderm induction and migration (Carmany-Rampey and Schier, 2001; Dougan et al., 2003). Several lines of evidence show that levels of Nodal activity are attenuated in aplnr mutants. Loss-of-function of Aplnr leads to a reduction in Nodal target gene expression, whereas activation of Aplnr signaling increases the expression of these same targets. By elevating Nodal levels in aplnr mutant/morphant embryos, we are able to restore cardiac differentiation. We find that loss of Aplnr attenuates the activity of a point source of the Nodal ligands Squint (Sqt, Ndr1) and Cyclops (Cyc, Ndr2) and that the Aplnr regulates Nodal signaling in a cell non-autonomous fashion. We propose a model in which the Aplnr fine-tunes Nodal activity during the onset of gastrulation to initiate the migration of lateral margin cells and proper heart formation. Aplnr may therefore act as a rheostat for the Nodal/TGFβ pathway. The zebrafish genome harbours two paralogues (aplnra and aplnrb) of the human APLNR gene. Only aplnrb, for which the first mutant was aptly named grinch (aplnrbs608, p.Trp90Leu), is known to be involved in early cardiogenesis (Scott et al., 2007; Zeng et al., 2007). In order to assess the contribution of aplnra to the process of gastrulation and heart development, we knocked it out using custom TALEN pairs targeted to its unique exon on chromosome 8 (Figure 1A). The resulting null allele, which we named max (the compliant dog companion of the Grinch), encodes a truncated 17-amino acid protein resulting from an early frameshift. The aplnramax allele (p.Thr16TrpfsX2) deletes 95% of Aplnra including its seven transmembrane domains (Figure 1A). Present at sub-Mendelian ratios, approximately 15% of mutant larvae from heterozygous aplnramax intercrosses showed pericardial edema (Figure 1B–C). As with aplnrb mutants (Scott et al., 2007; Pauli et al., 2014; Chng et al., 2013), sox17-positive endodermal progenitors at 8 hr post-fertilization (hpf) and myl7-positive cardiomyocytes at 1 day post-fertilization (dpf) were significantly reduced in numbers and intensity in aplnramax fish (Figure 1—figure supplement 1A–D). Note that in this current study a novel aplnrbhu4145 (p.W54X) allele is being used. An independent allele, aplnrains, resulting from a viral insertion was obtained from Znomics (Figure 1A). Homozygous aplnrains embryos recapitulated the phenotype of aplnramax and aplnrbhu4145 with similar pericardial edema (Figure 1D), reduced nkx2.5-positive cardiac mesoderm at the 15-somite stage (Figure 1F–H) and reduced myl7-positive cells at 2 dpf (Figure 1J–K). The number and spread of sox17-positive cells was significantly reduced in homozygous aplnrains when compared to wildtype (WT) and was not significantly different from aplnrbhu4145 single mutants (Figure 1M–O and Figure 1—figure supplement 1E–F). These aplnra mutant phenotypes suggest redundant functions for aplnra and aplnrb. aplnra mutant embryos display defects in endoderm and heart formation. (A) Schematic detailing the aplnramax and aplnrains alleles. TM indicates the transmembrane domain. (B–E) Gross morphology of aplnramax,aplnrains and aplnrains; aplnrbhu4145 mutant embryos compared to WT (wild type) at 48 hpf (hours post-fertilization). (F–I) nkx2.5 expression at the 15 somite stage in WT, aplnrbhu4145, aplnrains, and aplnrains; aplnrbhu4145 mutant embryos. Dorsal view with anterior to the top. (J–L) In situ hybridization showing expression of myl7 at 48 hpf in aplnrains and aplnrains; aplnrbhu4145 embryos compared to WT when viewed from the anterior. (M–P) Comparison of sox17 expression at 8 hpf between WT, aplnrains, aplnrbhu4145 and aplnrains; aplnrbhu4145 mutant embryos. Dorsal views are shown with a lateral view in inset panels. Double aplnrbhu4145; aplnrains mutants were generated to evaluate functional redundancy for these two paralogues in early development. Double mutant embryos exhibited normal morphology at 2 dpf with pericardial edema (Figure 1E). In contrast to aplnra or aplnrb single mutants, which usually possess significant cardiac tissue at 2 dpf, double mutant embryos exhibited either complete absence of or an extremely small heart (Figure 1L). In addition, double aplnra; aplnrb mutant embryos exhibited a further reduction in both the spread and number of sox17 expressing cells when compared to the aplnrains or aplnrbhu4145 single mutants (Figure 1M–P and Figure 1—figure supplement 1E–F). nkx2.5 expression was negligible in double mutants suggesting a near-complete absence of early cardiac progenitors (Figure 1I). It should be noted that the double mutant phenotype faithfully phenocopies that seen with the injection of aplnra/b morpholinos (MOs) both at the morphological and molecular levels as seen by the expression of these three diagnostic markers sox17, nkx2.5 and myl7 (Paskaradevan and Scott, 2012; Chng et al., 2013). Given the substantial reduction in the number of endodermal progenitors during gastrulation in aplnra; aplnrb double mutants, we investigated the subsequent effects on development of the endodermal-derived organs. The morphology of the gut tube was examined by performing wholemount RNA in situ hybridization (WISH) for foxa1, foxa2 and foxa3 at 48 hpf. While the pharyngeal endoderm appeared to be primarily intact, the most anterior population of these cells appeared to be either dramatically reduced or absent in double mutants (Figure 1—figure supplement 2A–I). Furthermore, the liver and pancreatic buds were consistently found to be smaller or absent, with misorientation of the pancreatic bud evident in some embryos. Taken together, this data suggests that Aplnra is required for both proper endoderm differentiation and cardiac development and that Aplnra and Aplnrb have redundant roles in these early processes. To gain insight into how Aplnr signaling regulates early cardiac development, we pursued a gene expression profiling approach. Comparative microarray analysis at 50% epiboly (5 hpf) of cDNA from WT and double aplnra/b morphants (injected with MOs) embryos revealed a reduction in a set of genes known to be downstream of the Nodal signaling pathway. Previous work has identified 72 Nodal-regulated genes in zebrafish at 6 hpf (Bennett et al., 2007). Remarkably nearly one-third (23 out of 72) of these genes were down-regulated in aplnra/b morphants (Figure 2A). The estimated probability of observing such a large overlap by chance is very small (8.6 × 10-17 by hypergeometric distribution), suggesting that this overlap might be biologically significant, i.e. that Nodal signaling is decreased in the absence of Aplnr function. Conversely, using Gene Set Enrichment Analysis (GSEA) (Subramanian et al., 2005), we found that the genes downregulated in aplnra/b morphants were significantly enriched for genes upregulated in zebrafish sphere stage embryos injected with sqt mRNA, which encodes for one of the activating Nodal ligands Squint (Nelson et al., 2014), further substantiating our hypothesis that Aplnra/b promotes Nodal signaling (Figure 2—figure supplement 1A). Given the known role of Nodal signaling in induction and migration of the mesendoderm (Carmany-Rampey and Schier, 2001; Feldman et al., 2000; Gritsman et al., 1999), we surmised that Aplnr might work upstream, or in parallel, to the Nodal pathway. To more directly assess Nodal signaling levels in the embryo, we injected a Nodal/TGFβ luciferase reporter construct into WT, aplnra/b MOs, oep MO and lefty1/2 MOs injected embryos. At 30% epiboly (4.7 hpf), embryos injected with MOs against the Nodal pathway antagonist lefty1/2 had higher levels of Nodal/TGFβ luciferase reporter activity, while those injected with a MO against the essential Nodal co-receptor oep (also known as cripto or tdgf1) had lower levels (Figure 2B). Consistently, aplnra/b morphant embryos exhibited significantly lower levels of Nodal/TGFβ reporter activity compared to WT, indicating a reduction in Nodal signaling in these embryos, in agreement with our microarray results. We next sought to confirm attenuated Nodal signaling following aplnra/b knockdown by means of chemical inhibition. Embryos were incubated from the sphere stage (4hpf) onwards with increasing concentrations of SB431542, which acts as a dedicated Alk4/5/7 antagonist. Phenotypes were scored according to the severity of cyclopia, a hallmark feature of Nodal impairment in zebrafish (Gritsman et al., 1999; Rebagliati et al., 1998), at 2 dpf (Figure 2C). Following multiple independent tests (N=4) aplnra/b morphants were found to be significantly more sensitive to SB431542 treatment than were WT embryos (Figure 2D–E), suggesting reduced (but not absent) Nodal signaling levels when Aplnr is lost. Aplnr deficient embryos exhibit a reduction in Nodal signaling. (A) List and Venn diagram of 23 Nodal target genes found to be down-regulated in a microarray of aplnra/b morphant embryos compared to WT at 50% epiboly (5.25 hpf). (B) Relative luciferase activity regulated by the Activin response element (ARE) in WT, aplnra/b morpholino (MO), oep MO and lefty1/2 MO injected embryos at 30% epiboly (4.7 hpf). Data are represented as means ± SEM. *p<0.05 unpaired two-tailed t-test. (C–E) Phenotypic characterization of WT (D) and aplnra/b morphant embryos (E) when treated with the indicated concentration of the Alk4/5/7 inhibitor SB431542 from the sphere stage (4 hpf) onwards. (F–S) Visualization of the expression of the canonical nodal target genes gsc, flh and sox32 in WT (F,J,N), aplnra/b MOs injected (G,K,O), aplnrains; aplnrbhu4145 double mutant (H,L,P) and aplnrb RNA injected treated with the Aplnr agonist ML233 (I,M,Q) embryos at 8 hpf. Embryos are viewed from the dorsal side. Quantification of the number and spread of sox32 expressing cells (R,S). Data are represented as means ± SEM. *p<0.05, **p<0.01 unpaired two-tailed t-test. We next used WISH to assess the expression of direct downstream targets of Nodal in double aplnra/b morphant embryos. The canonical Nodal target genes floating head (flh), goosecoid (gsc) and sox32 (Gritsman et al., 1999; Chen and Schier, 2001) all showed reduced expression in aplnra/b morphant embryos at 8 hpf relative to WT embryos (Figure 2F–G, J–K, N–O). Analysis of sox32 expression, which marks endodermal precursors, revealed both a reduced number of endoderm cells and a decreased extent of endodermal migration (quantified in Figure 2R–S), consistent with previous analysis of aplnrb mutants (Pauli et al., 2014; Chng et al., 2013). Down-regulation of all three genes was also documented in aplnra; aplnrb double mutant embryos (Figure 2H,L,P). Further analysis of additional Nodal target genes lefty1 and lefty2 also revealed a decrease in expression before and at the beginning of gastrulation (Figure 2—figure supplement 1B–G). We next examined if the ectopic activation of Aplnr could be sufficient to increase the expression of Nodal target genes. Overexpression of the ligands of Aplnr, Elabela and Apelin, each result in phenotypes similar to Aplnr loss-of-function, possibly as a consequence of ligand-mediated receptor internalization and signal desensitisation (Scott et al., 2007; Zeng et al., 2007; Paskaradevan and Scott, 2012; Pauli et al., 2014; Chng et al., 2013). To bypass this limitation, we instead used ML233, a non-peptide small molecule agonist of Aplnr signaling (Khan et al., 2011). Treating embryos injected with 150 pg of aplnrb RNA with 2.5 μM of ML233 resulted in a significant increase in the expression of the three Nodal targets gsc, flh and sox32 relative to WT (Figure 2I,M,Q) and increased both the number of endoderm cells and the extent of migration to a more anterior position (Figure 2R–S). Overexpression of aplnrb, or ML233 treatment alone, resulted in increased flh and gsc expression, whereas sox32 expression and endoderm migration was largely unaffected (Figure 2—figure supplement 2A–I). ML233 had no effect on gsc, flh or sox32 expression in aplnra/b morphants, indicating that the action of ML233 is Aplnr-dependent (Figure 2—figure supplement 2J–O). 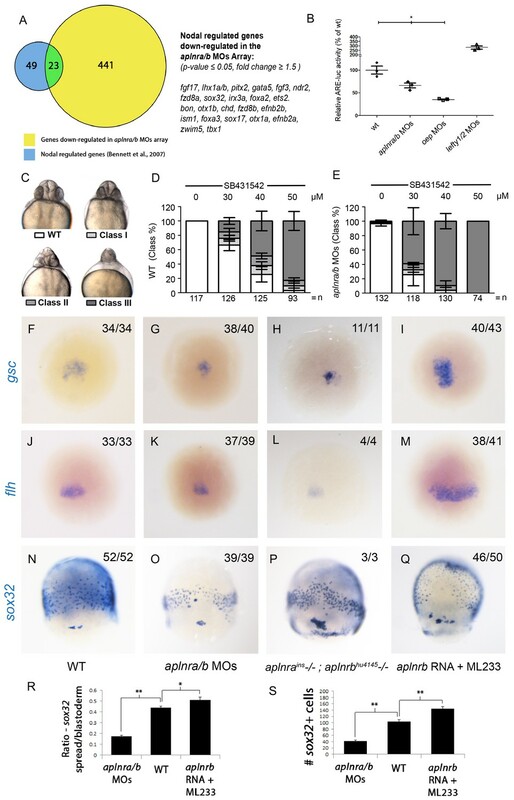 Moreover, overexpression of aplnrb in oep-depleted embryos was not sufficient to induce expression of gsc, flh or sox32, even in the presence of ML233 (Figure 2—figure supplement 2P–U). This argues against a scenario where Aplnr signaling is acting in parallel to Nodal signaling. Taken all together, these data suggest that Aplnr signaling is sufficient to boost endogenous levels of Nodal signaling at gastrulation stages. As Nodal signaling is reduced in aplnr mutant embryos, we reasoned that increasing Nodal may ameliorate or rescue cardiogenesis in the absence of Aplnr function. To test this hypothesis, we took two complementary approaches. We first elevated the levels of endogenous Nodal signaling by injecting a MO against lefty1, a direct negative feedback Nodal antagonist (Feldman et al., 2002). lefty1 MO was injected into embryos bearing two different aplnrb mutant alleles, s608/grinch (p.W90L) and hu4145 (p.W54X), which exhibit a small heart (Figure 3A–C). While the penetrance of the heart phenotype varied within each clutch, lefty1 MO treatment was capable of rescuing cardiogenesis in both mutants, with nearly all embryos showing rescue of the small heart phenotype (Figure 3D, note that 25% of embryos in a given cross would be homozygous null mutants, data for 2 independent clutches per mutant is shown). One caveat of this approach is that aplnra/b gene expression is regulated by Nodal signaling (D'Aniello et al., 2009; Pauli et al., 2014). It is therefore conceivable that elevating Nodal levels in aplnrb single mutants provides rescue simply by elevating aplnra gene expression. To address this issue, lefty1 MO was injected into embryos generated from an in-cross of aplnra; aplnrb heterozygous parents. Embryos were evaluated for heart formation by WISH for myl7 gene expression and subsequently genotyped. Strikingly, over 60% of aplnra/b double mutants exhibited proper cardiac formation when injected with lefty1 MOs, which was not observed in un-injected mutant siblings (Figure 3E–H). This suggests that elevated Nodal signaling is capable of rescuing the Aplnr cardiac phenotype, even in the complete absence of Aplnr function. Elevation of Nodal signaling in aplnr mutant/morphant embryos rescues cardiogenesis. (AC) myl7 WISH showing a representative heart phenotype at 48 hpf in a WT embryo (A) and two different aplnrb mutant alleles; hu4145 (B) and s608/grinch (C). Anterior is oriented towards the left. (D) Quantification of the number of embryos with a small heart at 48 hpf from individual clutches of embryos in which half were injected with lefty1 MO. Clutches were obtained from crosses of two different aplnrb heterozygous mutants (hu4145 and s608/grinch as indicated). (E–H) Classification of heart phenotype in aplnrains; aplnrbhu4145 double mutant embryos at 48 hpf when injected with lefty1 MO as compared to un-injected embryos. Severity of cardiac phenotypes was scored based on myl7 WISH (H). (I) Schematic displaying the transplantation of injected donor cells into the margin of host embryos. Contribution of transplanted cells to the heart is scored based on expression of the myl7:EGFP transgene in donor cells. (J–N”) Margin transplants of WT or tar* (activated Nodal receptor) overexpressing myl7:EGFP cells into WT or aplnra/b morphant embryos at 48 hpf. Arrow indicates the heart. Embryos are displayed from a lateral view with the anterior of the embryo towards the right. Data are represented as means ± SEM. *p<0.05, n.s. = not significant, Tukey’s Multiple Comparison test following significant (p<0.05) one way ANOVA. (O–-R) Gross morphology and myl7 expression at 24 hpf in WT (O), embryos injected with a sub-optimal dose of oep MOs (P), aplnra/b morphant embryos (Q) and aplnra/b/oep morphant embryos (R). As a complementary approach, we attempted to specifically elevate the levels of Nodal signaling within lateral margin cells and see if this rescued cardiac contribution. To perform this experiment, donor cells from myl7:EGFP transgenic embryos either injected or uninjected with taram-a* (tar*) RNA encoding a hyper-activated Nodal receptor (Renucci et al., 1996) were transplanted to the margin of aplnra/b morphant hosts (Figure 3I). As we have previously shown (Scott et al., 2007; Paskaradevan and Scott, 2012), WT cells placed at the margin of aplnra/b morphant hosts contributed to the myocardium at an appreciably reduced frequency (7.8%, N=3, n=157) as compared to when WT hosts were used (Figure 3J). In contrast, tar* overexpressing cells, when transplanted to the margin of aplnra/b morphant embryos, contributed to the myocardium at a much higher frequency (20.7%, N=3, n=164) with no significant difference when compared to transplantation of WT cells into WT hosts (22.5%, N=4, n=234), suggesting a near complete rescue (Figure 3J–N”). It should be noted that transplantation of WT tar* expressing cells into the margin of WT embryos did not increase the contribution of donor cells to the heart (22%, N=4, n=213). These experiments further argue that the heart defects observed in aplnr deficient embryos are suppressed if Nodal signaling is increased. To confirm that the absence of Aplnr results in lower Nodal activity, which consequently reduces/eliminates cardiogenesis, we further compromised Nodal signaling by partially depleting the embryo of Oep, the obligate Nodal co-receptor (Gritsman et al., 1999). In conditions where oep MO injections induced cardia bifida (Figure 3O–P), we observed that triple aplnra/aplnrb/oep-depleted embryos displayed more severe defects, including cyclopia, and were completely devoid of myl7 expression at 1 dpf (Figure 3Q–R). Collectively these results argue that Aplnra/b directly promotes Nodal signaling to ensure proper heart formation, with lower levels of Nodal signal being received by presumptive cardiac progenitors in the absence of Aplnr function. We next assessed how a reduction in Nodal signaling may cause a delay in mesendodermal ingression during gastrulation. Previous work has shown that Nodal target genes become activated depending on the dose and/or associated time of exposure to the Nodal ligand (Hagos and Dougan, 2007). We hypothesized that Aplnr may be required to boost the Nodal signal in order to activate the expression of genes required for ingression at the right time. A particularly interesting category of genes that were down-regulated in the double aplnra/b morphant microarray was the mesp family of transcription factors (Figure 4—source data 1). In mice, Mesp1/2 have been shown to regulate the migration of mesoderm through the primitive streak during gastrulation and are essential for cardiac formation (Kitajima et al., 2000). 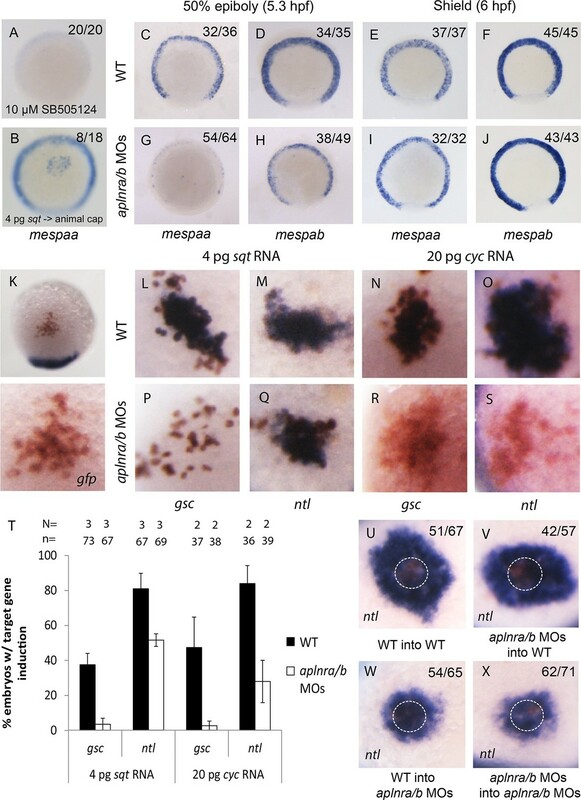 Treatment of 4.5–55-5.25 hpf WT embryos with Nodal inhibitor SB505124 completely abrogated mespaa and mespab expression (Figure 4A and Figure 4—figure supplement 1A). 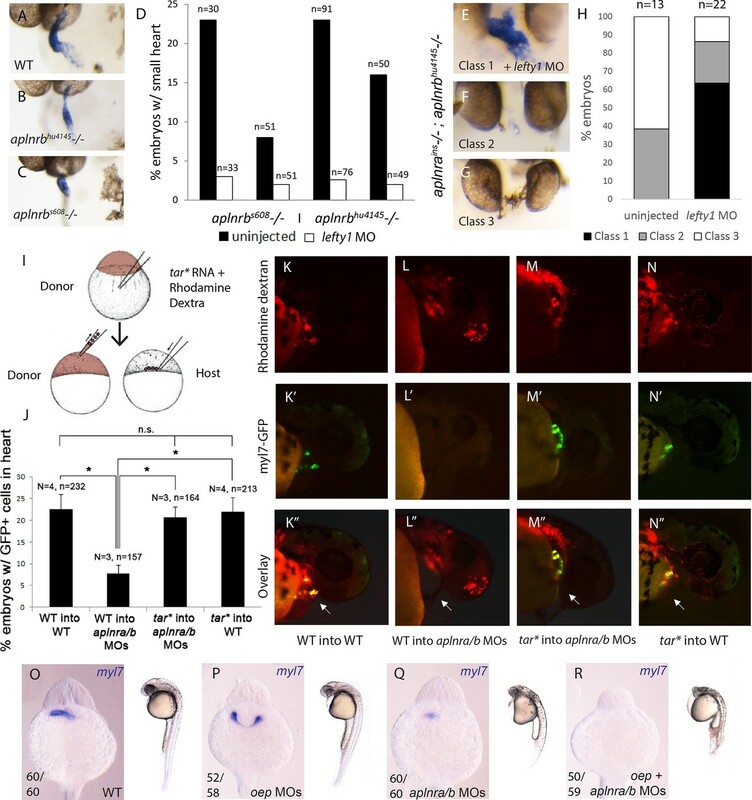 In addition, animal cap transplants of sqt-overexpressing cells induced mespaa/mespab expression, demonstrating that mesp genes are bona fide Nodal targets (Figure 4B and Figure 4—figure supplement 1B). By WISH, we confirmed that both mespaa and mespab are expressed around the margin during gastrulation (Cutty et al., 2012; Sawada et al., 2000) and that their expression is dramatically decreased in aplnra/b morphant embryos at 50% epiboly (5.25 hpf, Figure 4C–D and G–H). By carefully examining the expression pattern of mespaa/ab throughout development in WT and aplnra/b morphants, we found that at shield stage (6 hpf, 45 min after 50% epiboly) expression of both mespaa and mespab appeared to largely recover in aplnra/b morphant embryos (Figure 4E–F and I–J). Embryos at both stages were stage matched based on morphology, arguing against a general developmental delay as the cause of this phenotype. This demonstrates that Aplnr is required for timely activation of mesp genes and that the loss of Aplnr results in a delay in activation, rather than a general attenuation of Nodal target gene expression. Loss of aplnr results in a delay in mesp gene expression and the attenuation of Sqt and Cyc activity in a non-cell autonomous manner by aplnr. (A) Animal view of mespaa expression at 50% epiboly (5.25 hpf) in embryos treated with 10 μM of SB505124 from 4–5.25 hpf. Animal cap view with dorsal to the bottom. (B) Animal view of mespaa expression at 50% epiboly (5.25 hpf) in embryos in which cells expressing 4 pg of sqt RNA were transplanted into the animal cap. Animal cap view with dorsal to the bottom. (C–J) Expression of mespaa and mespab at 50% epiboly (5.3 hpf) (C,D,G,H) and the shield stage (6 hpf) (E,F,I,J) in WT and aplnra/b morphant embryos when examined by WISH. Embryos are viewed from the animal pole with dorsal at the bottom. (K) Animal cap transplant of GFP expressing control cells detected by WISH. (L–T) Animal cap transplants of sqt or cyc overexpressing cells into WT (L–O) or aplnra/b morphant embryos (P–S) at 5.5 hpf. gsc and ntl expression is displayed in blue and gfp expressing donor cells are marked in brown. Both donor cells and hosts are of the same background (WT into WT or morphant into morphant). Embryos are viewed from the animal pole with dorsal at the bottom. Data are represented as means ± SEM. (U–X) Animal cap transplants of cells expressing high levels of sqt RNA at 5.5 hpf. ntl expression is visualized in blue and gfp expressing donor cells are brown. Four different combinations of donor/host cells were examined, WT into WT (donor into host) (U), aplnra/b morphant into WT (V), WT into aplnra/b morphant (W) and aplnra/b morphant into morphant (X). Donor cells are circled in white. Embryos are viewed from the animal pole with dorsal at the bottom. We next sought to determine if Aplnr might directly act on the Nodal signaling pathway. An examination by WISH revealed that in aplnra/b morphants cyc and sqt expression appeared increased at 4 hpf, and normal at 4.7–5.3 hpf (Figure 4—figure supplement 1C–N), suggesting that attenuated Nodal signaling was not a consequence of reduced ligand expression. To address possible effects of Aplnr on Nodal signal transduction, we took advantage of a previously developed zebrafish Nodal point source assay (Chen and Schier, 2001). Nodal overexpressing cells were transplanted into the animal cap of host embryos and the ability to induce target genes was subsequently evaluated (Figure 4K). While in WT (WT host and donor) embryos 4 pg of sqt RNA was found to be sufficient to induce gsc expression, this dose was not sufficient to achieve gsc induction in aplnra/b morphant (host and donor) embryos (Figure 4L,P and T). To evaluate if this was a complete loss of Sqt activity or simply a reduction, we looked at the ability to induce the low threshold Nodal target gene ntl (Chen and Schier, 2001). In contrast to gsc, ntl expression was induced at a high frequency in both WT and morphant embryos, demonstrating that the loss of Aplnr resulted in an attenuation but not a complete loss of Sqt activity (Figure 4M,Q and T). Similarly, 20 pg of cyc RNA was less effective at inducing both gsc and ntl in aplnra/b morphant embryos, suggesting that Aplnra/b regulates the activity of both Nodal ligands (Figure 4N–O, R–S and T). To investigate whether Aplnr is required cell autonomously for its effect on Nodal signaling a further series of transplantation experiments were conducted. For these experiments, a higher dose of sqt RNA (40 pg) was injected in donor embryos, which when transplanted into recipient embryos induced a ring of ntl expression in the host cells surrounding the donor cells (Figure 4U, donor cells are encircled). While both WT and aplnra/b morphant donor cells induced a strong ring of ntl expression when transplanted into WT host embryos, a significantly smaller expression domain was induced when these cells were transplanted into aplnra/b morphant host embryos (Figure 4V–X). This suggests that Aplnra/b activity is not strictly required in Nodal secreting cells for proper Nodal signaling. In this study we demonstrate that the endoderm and cardiac defects in zebrafish lacking aplnr can be attributed to decreased Nodal signaling. We propose a model where Aplnr activity enhances the effect of Nodal signaling that allows for a Nodal threshold to be met at the right time in order to induce the expression of genes required for ingression of lateral marginal cells and proper heart formation. In the absence of aplnr function, a longer time frame is required for cells to reach this threshold of Nodal signaling, resulting in a delay in internalization (Figure 4—figure supplement 2A–B). These results are consistent with our previous observations on both the non-cell autonomous and temporal roles of Aplnr signaling in cardiac specification (Scott et al., 2007; Paskaradevan and Scott, 2012). Our conclusion on a Nodal-mediated effect of Aplnr is based on several lines of evidence in aplnra/b double mutants and morphants: 1) many classic Nodal target genes are downregulated; 2) ARE:Luciferase activity, a direct readout of Nodal input, is reduced; 3) sensitivity to Nodal inhibitor and lower Oep levels; 4) rescue of the phenotype by increased Nodal signal (tar* and lefty MO rescue); and 5) reduced effect of Sqt and Cyc point sources. The link between the Aplnr defect and Nodal signaling fits well into the context of previously published literature. Nodal signaling establishes the mesendoderm and a loss of Nodal signaling or its downstream transcriptional effectors results in a heartless phenotype (Feldman et al., 2000; Kunwar et al., 2003). Furthermore, cells lacking the functional Nodal co-receptor oep are unable to internalize during gastrulation and cannot contribute to the mesoderm or endoderm (Carmany-Rampey and Schier, 2001). These cells stay at the margin and continue to move towards the vegetal pole. Likewise, aplnra/b morphant cells display delayed ingression kinetics that do not support proper cardiac development (Paskaradevan and Scott, 2012). However, unlike the loss of Oep, loss of Aplnr results in a partial and not total loss of Nodal activity, and mesendodermal ingression is evident, albeit at a later time. This also provides a plausible explanation for the incomplete penetrance of the cardiac phenotype observed in aplnra and aplnrb mutant embryos (Scott et al., 2007; Chng et al., 2013). In mouse embryonic stem cells, graded Nodal signaling over 18 hr regulates differentiation to mesendodermal fates, with very subtle (two-fold) changes in levels of phospho-Smads having profound effects (Lee et al., 2011). As gastrulation proceeds far more quickly in zebrafish than it does in mice, this may also explain why profound cardiogenesis defects are not frequently seen in Aplnr/Apj mutant mice (Kang et al., 2013). Our report of the targeted genetic knockout of zebrafish aplnra supports the notion that both paralogues fulfil a common role during cardiogenesis. In contrast to previous work with aplnra MOs (Nornes et al., 2009), we find that aplnra mutants do not have epiboly defects, but rather only share features of the aplnrbgrinch/hu4145 cardiac and endoderm phenotypes. As loss of either aplnra or aplnrb can have effects on cardiac progenitor specification, we hypothesize that both act in concert to modulate Nodal signaling, with loss of either potentially resulting in a sufficient decrease to impinge on cardiogenesis. It has been previously demonstrated that distinct Nodal target genes require different Nodal activity thresholds for activation (Chen and Schier, 2001; Lee et al., 2011). The level of Nodal signal that a cell perceives depends on both the concentration and duration of the signal (Hagos and Dougan, 2007; Dubrulle et al., 2015). In aplnr mutants, given the reduction in Nodal signaling, marginal cells likely require a longer exposure to Nodal ligands before a certain threshold is reached to induce migration and mesp expression. This may explain why endodermal progenitors do eventually migrate and why mesp expression recovers in aplnr morphant embryos. In support of this hypothesis, mesp expression in aplnr morphant embryos at 50% epiboly appears to be retained in the most marginal blastomeres, consistent with the fact that these blastomeres are closest to the source of Nodal ligand. The basic helix-loop-helix Mesp transcription factor family has been shown to regulate the migration of mesoderm through the primitive streak in mice, and play key roles in cardiac development in several contexts (Kitajima et al., 2000; Saga et al., 1999; Satou et al., 2004; Bondue et al., 2008). This provides a molecular mechanism for how reduced levels of Nodal may translate into a delay of cell movement during gastrulation. However, we do not believe that defects in mesp expression can fully account for the aplnr cardiac phenotype. In our hands, mespaa overexpression was not sufficient to rescue cardiogenesis in aplnr morphants or mutants (A.R.D. and I.C.S., unpublished results). On the other hand, finer temporal expression of mesp expression may be required for proper cardiac specification. The cellular autonomy of Aplnr function in cardiac progenitor development has been an area of confusion, notably as both cell autonomous (Scott et al., 2007; Zeng et al., 2007) and non-autonomous (Paskaradevan and Scott, 2012) roles have been documented. Our results clearly show that Aplnr is not absolutely required in cells expressing Nodal ligands for signaling activity (Figures 4U–X), arguing against a model where Aplnr affects ligand secretion. Given that our previous experiments suggest that the Aplnr is also not required in cardiac progenitors themselves, we do not favour a model where Aplnr is required cell autonomously for reception or readout of the Nodal signal. It is possible that rather than playing a strictly cell autonomous (in cardiac progenitors) or non-autonomous (in Nodal signal sending cells) role, a threshold level of Aplnr activity is required in cells surrounding cardiac progenitors to ensure that proper levels of Nodal signaling can take place (Figure 4—figure supplement 2C–D). This model helps explain previous conflicting results, in which aplnra/b morphant donor cells typically have a reduced, but not completely absent, ability to develop as cardiomyocytes (Scott et al., 2007; Paskaradevan and Scott, 2012). It may be that in cases where a larger donor clone lacking Aplnr function is assayed, many cells inside the clone (encompassing both cardiac progenitors and other cells) do not receive the proper Nodal signal for cardiogenesis. Aplnr signaling may act, for example, to regulate Nodal ligand processing or activity, which has been shown to occur extracellularly (Beck et al., 2002). The interpretation of transplant experiments may therefore be confounded by the size of donor tissue. The role of a “community effect” in amplifying the Nodal signal to drive collective epithelial-to-mesenchymal transition during gastrulation has recently been described (Voiculescu et al., 2014). As Aplnr is both activated by Nodal (at the level of gene expression) and in turn potentiates Nodal signaling, this may provide a feed-forward mechanism to help achieve maximal Nodal signaling for proper gastrulation in a timely manner. Mechanistically, how Aplnr activity impinges on the Nodal pathway remains to be determined. Signaling cascades downstream of Aplnr, both G protein-dependent and -independent, have been described (reviewed in (Chapman et al., 2014; O'Carroll et al., 2013). Which of these are required for Aplnr function in cardiac development, or if a new pathway is involved, remains to be elucidated. How signaling at the level of the Aplnr happens in the context of early gastrulation also remains unknown. Numerous studies have described roles for the classical Apelin/Aplnr hormone GPCR (G-protein Coupled Receptor) signaling pair in adult physiology, however in the context of early heart development Apelin does not appear to be the correct Aplnr ligand (Scott et al., 2007; Chng et al., 2013; Ashley et al., 2005; Kuba et al., 2007; Szokodi et al., 2002). This has been confirmed by the recent discovery of a second small endogenous peptide ligand for Aplnr, Elabela (www.elabela.com), whose mutation also results in loss of cardiac differentiation in zebrafish (Pauli et al., 2014; Chng et al., 2013) and mice (unpublished results L.H and B.R). How these two ligands may fit into the Aplnr regulation of Nodal remains an intriguing area for future investigation. In conclusion, we find that Aplnr is required to enhance Nodal signaling in order to activate genes required for proper cell movement and consequently cardiac development at the right time. This work opens several lines of future investigation on the early events required for the movement of the mesendoderm during gastrulation and early cardiac progenitor development. The levels and timing of key signaling pathways such as Nodal/TGFβ are essential to developmental output, as can be measured during differentiation of pluripotent stem cells in culture (Kattman et al., 2011). Similar mechanisms to that described here for Aplnr signaling may therefore remain to be discovered for other major developmental pathways. As to why lateral populations are specifically affected in aplnra/b mutants and not dorsal ones, where Nodal signaling is particularly prevalent, we speculate that the levels of Nodal modulated by Aplnr will not have as large a consequence in a high Nodal signaling environment like the shield/dorsal aspect of the embryo. Furthermore, only aplnra and not aplnrb is expressed in the dorsal part of the embryo (Tucker et al., 2007). Further, given that Aplnr signaling has been shown to regulate multiple aspects of adult physiology (reviewed in (Chapman et al., 2014; O'Carroll et al., 2013), the role of this novel signaling mechanism and the potential functions of Elabela and/or Apelin in the context of physiological homeostasis and disease (Ho et al., 2015; Murza et al., 2016) are areas of great interest. Zebrafish were housed and handled as per Canadian Council on Animal Care and Hospital for Sick Children Laboratory Animal Services guidelines. Zebrafish embryos were raised at 28 degrees Celsius according to standard techniques (Westerfield and Book, 1993). The Tg(myl7:EGFP)twu34 line and aplnrbs608 (grinch, p.W90L) mutants have been previously described (Scott et al., 2007; Chng et al., 2013; Huang et al., 2003). aplnrbhu4145 (p.W54X) fish were a gift from Stefan Schulte-Merker. In the aplnrbhu4145allele a STOP codon is introduced at the 54th amino acid, resulting in a severely truncated protein with no predicted function. A loss-of-function aplnramax mutant line was generated with TALEN pairs purchased from ToolGen (South Korea). The TALEN-binding sites are as follows: 5’ TACACCGAGACATACGATTA 3’ and 5’ TCACACCCAGAGTCATTATA 3’. An additional aplnrainsmutant allele was purchased from Znomics, Inc. (Portland, OR). aplnraZM00177433Tg has a (c.886_887insTg(ZM)) retroviral insertion (Amsterdam and Hopkins, 2006) that disrupts the ORF of the single coding exon. Imaging was performed using a Leica DFC320 camera on a Leica M205FA stereomicroscope. In the aplnrbhu4145 mutant allele a premature stop codon has been induced into the coding sequence at amino acid position 54. Primers used for genotyping are used to amplify a 215 bp product which when cut with AciI yields fragments of 140 bp, 52 bp and 25 bp, the mutant allele will not be cut with AciI. Forward primer: CATCTTCATCCTGGGACTCACTG Reverse primer: AGCACCACATAGCTGCTGATCTT. For genotyping the allele of aplnrb grinch the same primers were used as for the hu4145 allele, but the resultant PCR product was instead cut with EaeI, generating a 141 bp of the 215 bp product in the mutant allele. Genotyping the aplnraZM00177433Tg allele was performed using the following primers to detect the presence of the insertion: Forward primer: ACCCTGGAAACATCTGATGGTTC; Reverse primer: AACGGATTGAGGCAGCTGTTGAC. To determine the presence of the WT aplnra allele the following forward primer is used instead: Forward primer: CTCGGGTTTCTTCTGCCTTTCCT. Genotyping of the aplnramaxallele was performed using the following primers to detect the absence or presence of the deletion. Forward Primer: CGCTTCAGCTTCCAGTGAG; Reverse Primer: ATGTTGACCAGCACCACGTA. To determine for the presence of the WT aplnra allele the following forward primer was added: Forward Primer: CACCGAGACATACGATTACTACG. To determine for the presence of the aplnramax allele the following forward primer was added: Forward Primer: CACCGAGACATACGATTACTACTG. An Agilent zebrafish microarray (V3: 026437) was used to compare the gene expression profile of WT vs aplnra/b morphant embryos. 4 replicates were performed and for each experiment 20 embryos were collected at 50% epiboly and total RNA was prepared using the RNAqueous kit (Ambion, Waltham, MA). Microarray results were analyzed using Genespring v11.0.1 (Agilent Technologies, Inc., Santa Clara, CA). As recommended by the manufacturer, the data was normalized using Agilent’s Spatial Detrending Lowess normalization. All data analysis was performed on log2-transformed data. Standard single factor t-tests were used followed by ranking with fold changes. After normalization and averaging the four chips, the data was filtered to remove the probes that showed no signal in order to avoid confounding effects on subsequent analysis (probes below the 20th percentile of the distribution of intensities were removed). MIAME-compliant microarray data was submitted to GEO (accession #GSE58683). GSEA was performed with default settings using aplnra/b MO-downregulated genes as a custom gene set for comparison against the sqt overexpression dataset from #GSE51890. Embryos were injected at the one cell stage according to standard procedures. Translation blocking MOs against aplnra (5’ – cggtgtattccggcgttggctccat – 3’) and aplnrb (5’ - agagaagttgtttgtcatgtgctc – 3’) have been previously described (Scott et al., 2007). aplnr morphant embryos were co-injected with 0.5 ng of aplnrb MOs and 1ng of aplnra MOs. The translation blocking MOs against lefty1 (5’ – cgcggactgaagtcatcttttcaag – 3’) has been previously described (Feldman et al., 2002). lefty1 morphant embryos was injected with 6 ng of MOs per embryo. Translation blocking MOs against oep (5’ - gccaataaactccaaaacaactcga – 3’) has been previously described (Feldman and Stemple, 2001), with 2.5 ng injected per embryo. In vitro transcribed RNA was prepared using the mMessage Machine Kit (Ambion) and purified using the MegaClear kit (Ambion). 0.5 pg of tar* RNA was injected per donor embryo (Renucci et al., 1996). WISH was carried out using DIG labelled antisense probes as previously described (Thisse and Thisse, 2008). Double ISH was performed against a fluorescein-labelled gfp S65C probe using previously established protocols (Zhou et al., 2011). Fluorescein-labelled probes were detected using INT/BCIP and DIG labelled probes with NBT/BCIP. Probes for mespaa, mespab, sqt and cyc were prepared from templates containing full length coding sequences. Probes for myl7, nkx2.5, gsc, sox17, sox32, foxa1, foxa2, foxa3 and flh have been previously described (Kikuchi et al., 2001; Schulte-Merker et al., 1994; Talbot et al., 1995; Chen and Fishman, 1996; Alexander et al., 1999; Yelon et al., 1999; Inohaya et al., 1997; Akimenko et al., 1994; Odenthal and Nüsslein-Volhard, 1998). ImageJ analysis software was used to document sox17 and sox32 cell numbers and spread. Transplantation was performed as previously described (Scott et al., 2007). Donor embryos were injected with 5% tetramethylrhodamine dextran (10,000 MW, Molecular Probes, Waltham, MA) as a lineage tracer. Transplants were performed by placing 10–20 cells into the margin or animal cap of a host embryo at the sphere stage (4 hpf). For cyc/sqt animal cap transplants 200 pg of gfp S65C RNA was co-injected into donor embryos. Double ISH was performed to visualize donor cells. Nodal inhibition was performed by treating embryos with either SB505124 (10 uM) or SB431542 (Sigma, St. Louis, MO) in egg water/0.1% DMSO. The APLNR agonist ML233 was obtained from Glixx Laboratories Southborough, MA). Embryos were treated with 2.5 μM ML233 in egg water/1% DMSO from the sphere stage onwards. Embryos were injected with 90 pg of ARE3-luc (Huang et al., 1995), which contains three copies of the Activin responsive element (ARE), together with 10 pg of CMV-pRL vector (Promega, Madison, WI) at the 1-cell stage. At 30% epiboly, three groups of 20 embryos were lysed with passive lysis buffer (Promega) at room temperature for 20 min. The firefly luciferase activity, normalized to that of Renilla luciferase, was measured using the Dual luciferase assay system (Promega). The Journal of Neuroscience 14:3475–3486. Biochemistry and Cell Biology = Biochimie Et Biologie Cellulaire 92:431–440. The International Journal of Developmental Biology 56:285–294. Development, Growth & Differentiation 39:191–197. In: Probe Reports from the NIH Molecular Libraries Program. Journal of Medicinal Chemistry, 59, 10.1021/acs.jmedchem.5b01549. The Journal of Endocrinology 219:R13–R35. Development Genes and Evolution 208:245–258. Proceedings of the National Academy of Sciences of the United States of America 95:9932–9937. Gene Expression Patterns : GEP 7:258–265. Oregon: University of Oregon Press. Thank you for submitting your work entitled "The Apelin receptor enhances Nodal/TGFβ signaling to ensure proper cardiac development" for consideration by eLife. Your article has been reviewed by three peer reviewers, and the evaluation has been overseen by a Reviewing Editor and Sean Morrison as the Senior Editor. In general all four reviewers who assessed your manuscript agree that your report represents a significant advance from your previous work in this area and revise current models about the cell autonomous/non-autonomous modes of action of the Apln receptor. Via the use of a novel mutant in combination with morphant analysis the authors show that Apln receptors act redundantly in specification of heart progenitors. Apln receptor signaling is required for robust Nodal signaling, leading to an inability to efficiently up-regulate mespaa and mespab and specify cardiac progenitors. In support of this conclusion over-expression of Nodal in the mutant/morphant embryos is sufficient to rescue the cardiac specification defects. 1) In revising the manuscript you should attempt to very clearly explain the cell autonomous versus non-autonomous roles for Aplnr in specification of the cardiac progenitors. This is somewhat confusing for the reader in light of your previous apparently contradictory findings published in Dev Cell and Biology Open. For example, wild type cells are unable to contribute to the heart in aplnra/b morphant host embryos, while aplnra/b morphant cells are able to contribute to heart in wild type embryos indicating non-autonomous role (Biol. Open 1: 275-285, 2012). However, placing agtrl1b (aplnrb) morphant cells in a wild-type environment did not appreciably rescue their ability to form myocardium, suggesting that Agtrl1b signaling is required autonomously in myocardial progenitors (Dev. Cell 12: 403-413, 2007). While you do discuss autonomous vs. non-autonomous roles in the Discussion, it would be helpful if your current conclusions could be summarized as a model (similar to Figure 6 of Biol. Open 2012). 2) It is also clear that there is an early endoderm defect in the double mutants. Knockdown of aplnra results in disrupted sox17 expression levels and distribution, and that this is a similar phenotype to that observed in aplnrb knockdown. The aplnrb mutant has a normal endodermal organ development (Scott et al. Dev Cell), but it seems sox17 expression at gastrulation stages has only been described in the double knockout using morpholinos, not in the single aplnrb mutant? Therefore, the disrupted sox17 expression in the double knockout could simply be the consequence of knocking down the a variant. Have you analysed sox17 expression in the aplnrb mutant/morphant to back up this claim? 3) Along the same lines it would be important to know if there are defects later in endodermal organ development in the double mutants. For example, does the gut develop normally, are the gut associated organs specified normally? While the cardiac phenotype (regulation of the mesp genes etc.) has been investigated fully, the effect of loss of aplnr function on the endoderm lineage, specification of which is regulated by dose-dependent Nodal signaling in both fish and mouse, was not investigated. More information should be included if possible to this point. 1) In revising the manuscript you should attempt to very clearly explain the cell autonomous versus non-autonomous roles for Aplnr in specification of the cardiac progenitors. This is somewhat confusing for the reader in light of your previous apparently contradictory findings published in Dev Cell and Biology Open. For example, wild type cells are unable to contribute to the heart in aplnra/b morphant host embryos, while aplnra/b morphant cells are able to contribute to heart in wild type embryos indicating non-autonomous role (Biol. Open 1: 275-285, 2012). However, placing agtrl1b(aplnrb) morphant cells in a wild-type environment did not appreciably rescue their ability to form myocardium, suggesting that Agtrl1b signaling is required autonomously in myocardial progenitors (Dev. Cell 12: 403-413, 2007). While you do discuss autonomous vs. non-autonomous roles in the Discussion, it would be helpful if your current conclusions could be summarized as a model (similar to Figure 6 of Biol. Open 2012). We agree with the reviewers and editors that we did not fully explain our model or these published discrepancies in the original manuscript. We have altered text in the Discussion (subsection “The Nature of the Aplnr Effect on Nodal Signaling”) to address this, and based on your excellent suggestion have added new model schematics (Figure 4—figure supplement 2C-D) to illustrate our key points. As we now articulate in the Discussion, we believe these discrepancies in the literature potentially stem from the initial size of donor clones introduced in transplants, which may influence the neighbouring environment of a cell and therefore confuse interpretations of cellular autonomy of action of the Aplnr. We thank the editors for providing the opportunity to include a more detailed examination of endoderm defects in aplnra, aplnrb and aplnra; aplnrb mutants (see point 3 below as well). We have added images and quantification of sox17 expressing endoderm cells during gastrulation in single aplnrb mutants (Figure 1O, Figure 1—figure supplement 1E-F). We find that they exhibit a decrease in both the number of expressing cells and the spread of these cells when compared to WT that is not significantly different from aplnra single mutants. Double aplnra; aplnrb mutants however exhibit a further reduction in both sox17 cell number and spread compared to the single mutants, as would be expected if aplnra and aplnrb have partially redundant functions. To address this point we have performed in situ hybridization for three different markers of the endoderm (foxa1, foxa2 and foxa3) in double aplnra; aplnrb mutants. We find that at 48 hpf endoderm formation appears defective with significant abnormalities in the most anterior pharyngeal endoderm and the formation of the liver and pancreatic buds (Figure 1—figure supplement 2). It is likely that the variability seen in these phenotypes reflects the early deficit (but not absence) of endodermal progenitors formed in double mutants, although we cannot rule out a later function for Aplnra/b in endodermal organ development. We would like to thank all members of the Scott lab for helpful insight and discussion. Special thanks to Angela Morley for excellent zebrafish care and facility maintenance and to Jeff Burrows for generating the model figure. Thanks to Brian Ciruna, Helen McNeill and Freda Miller for helpful discussions and to Norm Rosenblum and the University of Toronto MD/PhD program for support. Thanks to Stefan Schulte-Merker for the aplnrbhu4145 allele. ARD was supported by a Canadian Institutes of Health Research Vanier Canada Graduate Scholarship. This work was supported by a grant from the Canadian Institutes of Health Research to ICS (Funding Reference 123223). BR is a fellow of the Branco Weiss Foundation, an A*STAR Investigator and Young EMBO Investigator. This work is funded by a Strategic Positioning Fund on Genetic Orphan Diseases from A*STAR, Singapore. Animal experimentation: Zebrafish were housed and handled as per Canadian Council on Animal Care and Hospital for Sick Children Laboratory Animal Services (LAS) guidelines under LAS protocol number 33584. © 2016, Deshwar et al.